XML Completion -- Check to enable XML completion, including XML code completion. See Editing your XML document for more information on XML completion. Add required attributes -- XMLBlueprint will automatically insert the required attributes for an element inserted by XML Completion. Add required elements -- XMLBlueprint will automatically insert the required child elements for an element inserted by XML Completion. 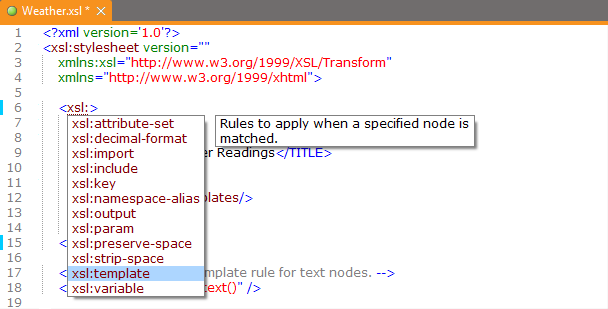 Add closing tag -- XMLBlueprint will automatically insert the closing tag for an element inserted by XML Completion. Auto-close tag when typing "</" -- As soon as you type "</", XMLBlueprint will complete the tag. 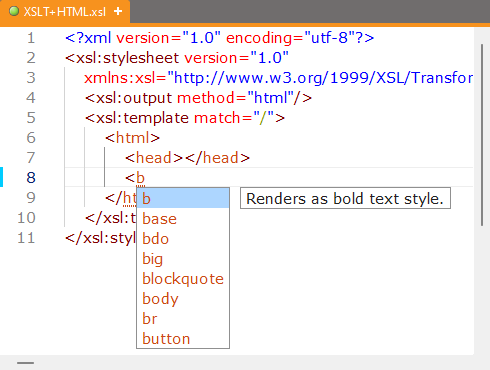 XSLT Completion for (X)HTML (<xsl:output method="..."/>) -- If your XSLT Stylesheet starts with <xsl:output method="html"/> (XSLT 1.0, XSLT 2.0 and XSLT 3.0) or <xsl:output method="xhtml"/> (XSLT 2.0 or XSLT 3.0), XML Completion will include HTML elements and attributes. 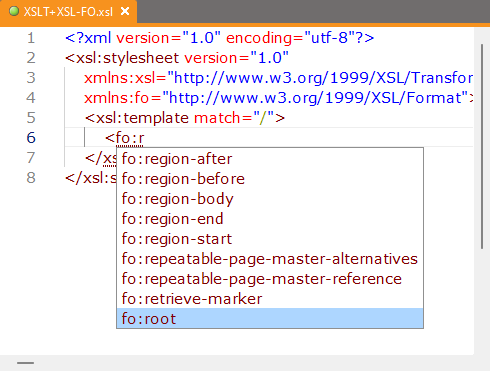 XSLT Completion for namespaces other than XSLT -- If your XSLT Stylesheet includes another namespace (for example xmlns:fo="http://www.w3.org/1999/XSL/Format"), XML Completion will include elements and attributes declared in that namespace. 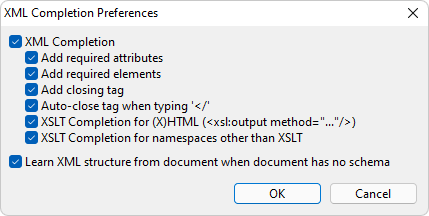 The namespace must be associated with the actual schema, either in the XSLT Stylesheet, or by adding the schema in the Default Schemas dialog. Learn XML structure from document when document has no schema -- When an XML Document is opened that does not specify a DTD or Schema, XMLBlueprint automatically learns the document structure and uses it for XML Completion.